From Downtown - Take Memorial Drive west to the Jackson Hill Exit (just after Waugh Drive). Go North on Jackson Hill. From Memorial - Take Woodway/Memorial East to the Shepherd exit. Turn left/north. At the first stoplight/Feagan, turn right. Go to the 2nd stop sign/Jackson Hill and turn left. From West University - Go North on Kirby Drive. At Shepherd turn left. At the first stoplight/Feagan, turn right. 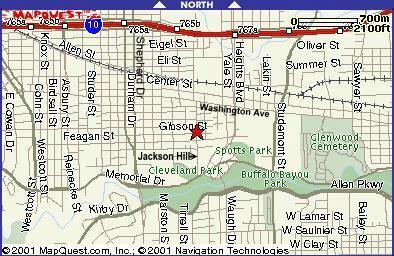 Go to the 2nd stop sign/Jackson Hill and turn left.